Provenance: Swiss private collection. From December 1999 with Galerie Wey + Co., Luzern. From the latter acquired by another Swiss private collection on 18 July 2001. Condition: Body reassembled from six pieces without any missing parts. Head reattached. The wings today pierced on the shoulder with a metallic pin. 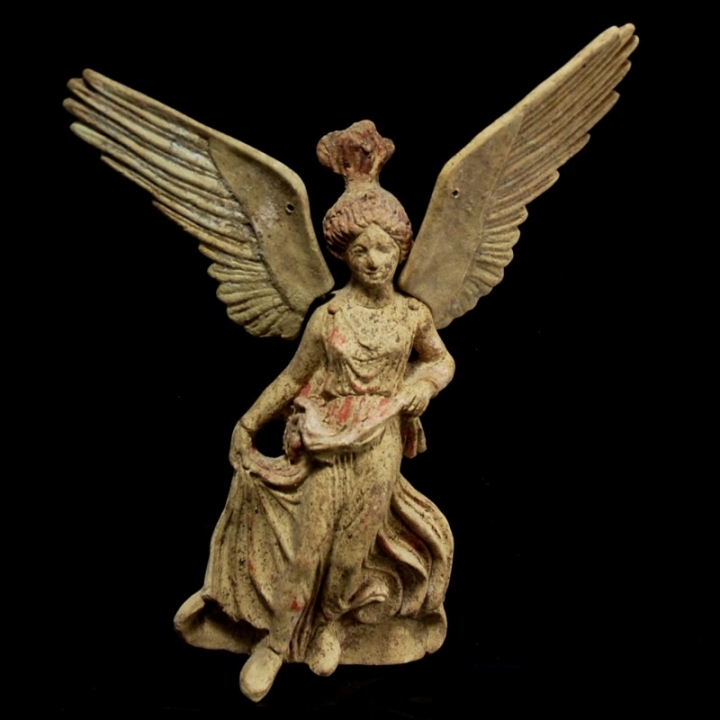 Description: Very fine terracotta sculpture of a flying victory goddess Nike with raised wings. She wears a peplos pinned on the shoulder with two circular fibulae. With her left hand she holds the overfold (Apoptygma) around her waist, the right hand stretched sideways holding one tip of the blowing drapery. The features are finely worked out, the wavy hair is pulled up to a high bun. On the wrists the goddess wears bracelets. The wings are separately worked out and pierced on the shoulders with a pin. With numerous red and white color remains. The flat back and small perforations in the wings and head suggest that the figure once possibly was mounted as an applique on a high-quality vessel. To the same vessel belonging is our reference number 2275. Possibly from southern Italy. Mounted.